•	Contains Black Oil Sunflower Seeds, Safflower, Peanut, White Proso Millet, Calcium & Grit. •	These Seeds Are Held Together With A Natural Binder To Stay Together In All Kinds Of Weather. •	Fortified With Vitamins, Minerals & Electrolytes For The Overall Health & Well Being Of Wild Birds. Two-pound cake contains black oil sunflower seeds, safflower, peanuts, white proso millet, calcium and grit. These seeds are held together with a natural binder to stay together in all kinds of weather. Fortified with vitamins, minerals and electrolytes for the overall health and well-being of wild birds, this cake is made with the premium seeds birds prefer. • Suet provides extra nutritional "energy"
Blue 1. Treats will become soft and pliable at 100 degrees if exposed to extreme heat. They will return to normal hardness at room temperature. Our quality allows suet to be fed YEAR ROUND. 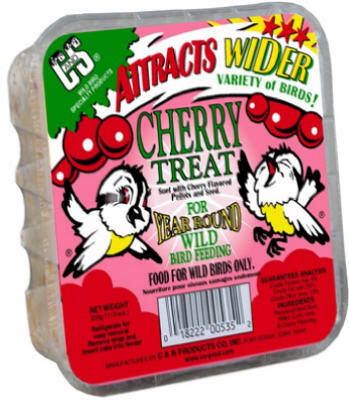 C&S Cherry Treat Suet 11.75 oz. Rendered Beef Suet, Corn, White Millet, Oats, Milk, Cherries, Red 40, Blue 1. Treats will become soft and pliable at 100 degrees if exposed to extreme heat and return to normal hardness at room temperature. C&S quality allows suet to be fed YEAR ROUND. • Become soft and pliable at 100 degrees if exposed to extreme heat. Rendered Beef Suet, Corn, White Millet, Sunflower Hearts. Treats will become soft and pliable at 100 degrees if exposed to extreme heat. They will return to normal hardness at room temperature. Our quality allows suet to be fed YEAR ROUND. Allergen Statement: This product may contain one or all of the following allergens: Peanuts, Milk, Tree Nuts, Soy, Fish, and Shellfish. Corn, Roasted Peanuts, Rendered Beef Suet, Oats, Soy Oil, Mealworms. C&S Mealworm Delight offers our proven Peanut Delight formulation with the addition of dehydrated meal worms that the birds love. This easy to use feeding alternative will attract the same birds as feeding live meal worms. Allergen Statement: This product may contain one or all of the following allergens: Milk, Tree Nuts, Soy, Fish, and Shellfish. Rendered Beef Suet, Corn, White Millet, Roasted Peanuts, Oats, Milk. Treats will become soft and pliable at 100 degrees if exposed to extreme heat. They will return to normal hardness at room temperature. Our quality allows suet to be fed YEAR ROUND. E-Z Fill Suet Baskets are a necessary key to your successful wild bird feeding. Specially designed to make filling the basket a snap. No melt all-season suet cake blended with peanuts and sunflower seeds. Attracts these colorful songbirds: Cardinals, Chickadees, Goldfinches, Juncos, Kinglets, Nuthatches, Purple Finches, Siskins, Tanagers, Titmice, Warblers, Woodpeckers and Wrens. Not for human consumption. Store in a cool, dry place. C&S Orange Treat Wild Bird Suet 11 oz. • For YEAR-ROUND Wild Bird Feeding. Suet with orange flavored pellets and seed for year round wild bird feeding. Food for wild birds only. Orange Treats will become soft and pliable at 100 degrees if exposed to extreme heat. They will return to normal hardness at room temperature. Their high quality process allows this orange flavored bird suet to be fed YEAR ROUND. Rendered Beef Suet, Corn, White Millet, Oats, Milk, Artificial Orange Flavoring, Yellow 6. Kaytee Treat Bells are convenient, ready-to-hang, instant feeders and made with only the finest. Peanut Delight No-Melt Plug 12 oz. 12 oz. peanut delight no-melt plug. corn, roasted peanuts, rendered beef suet, oats and soy oil. delights are mixed into a soft dough texture which is pressed into plug form. c&s's process creates the only true no melt suet product line. for year round wild bird feeding. allergen statement: this product may contain one or all of the following allergens: milk, tree nuts, fish, and shellfish. Rendered Beef Suet, peanuts, corn & oats. Treats will become soft and pliable at 100 degrees if exposed to extreme heat. They will return to normal hardness at room temperature. Our quality allows suet to be fed YEAR ROUND. C&S Raisin Delight 11.75 oz. Corn, Rendered Beef Suet, Oats, Roasted Peanuts, Raisins, Soy Oil. Delights are mixed into a soft dough texture which is pressed into cake form. C&S’s process creates the only true NO MELT suet product line for YEAR ROUND Wild Bird Feeding. Allergen Statement: This product may contain one or all of the following allergens: Peanuts, Tree Nuts, Soy, Fish and Shellfish.